Can a scientist also be religious? 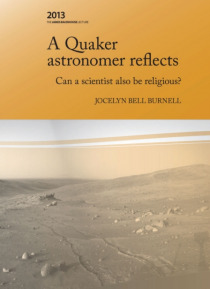 How, and with what limitations?World renowned astronomer and Quaker Jocelyn Bell Burnell reflects on the big issues confronting scientists who also have a strong spiritual belief system. How can the principles of science be reconciled with the faith required by religion? Does scientific investigation call into question the givens of religion? While specific to he… r Quaker beliefs, Burnell's reflections apply to many other religions as well.This is the 2013 James Backhouse Lecture Series, sponsored by the Society of Friends (Quakers) in Australia. This lecture describes astronomers' current understanding of the Universe we live in and shows how the lecturer combines her Quakerism and her science.